News, Journal Article: Show Your Work! A New Book by Austin Kleon. I recently started opening my studio to the public, for arts trails and the like, and generally building on the successes of Gallery exhibitions. While I've been happy with the initial results, the holy grail is to get work out to as broader audience as possible, and that requires reaching out to the Internet. Let's face it though, the Internet is huge mind numbingly huge, and to plonk up a website expecting the masses to flock to it, is not a strategy lending itself to overnight success. (I've got a website, and crucially I've had no overwhelming major instant success). There are artists and there are art lovers, how do we connect? I'm not sure of the best approach to take at the moment or if there is a one size fits all answer, it certainly helps to learn from the experiences of others. So with that in mind, and after going through some twitter feeds (also the train this morning), I came across a link to Show Your Work! by Austin Kleon. 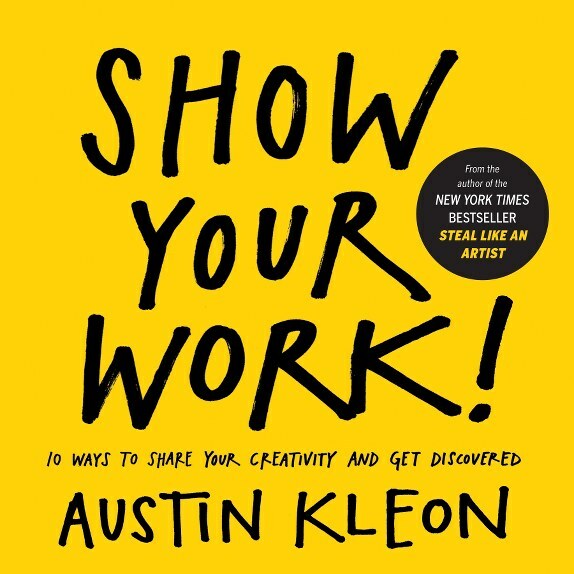 Show Your Work is "A book for people who hate the very idea of self-promotion", and that sounds like something containing some of the answers I'm looking for. Unfortunately I'll have to wail until March to gain more insight. If I find have major success down other avenues of inquiry before then, I'll let you know. Show Your Work! (2013) Author: Austin Kleon.